Have you ever thought about what would happen if you had a real financial emergency in your life? Do you have enough money in the bank to cover your potential expenses? If you have an emergency fund plan in place you do! 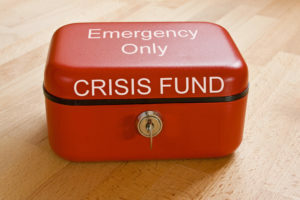 Here is everything you need to know about having an emergency fund. An emergency fund is an account set aside to save money specifically and only for true emergencies. Unexpected health expenses, job loss and vehicle emergencies would fall into the category of things that would make good use of your emergency fund. Of course, you hope you never have to use it, but when you do find yourself in a financial crisis, if you have an emergency fund in place the peace of mind is worth it. Well, as we stated above, if you get into a deep financial problem, you will have the money set aside to cover the expenses. Many people who don’t have money saved in an emergency fund find themselves in a bind and end up having to take out loans or put their expenses on credit cards, which only magnifies their financial issues. This is a vicious cycle, and it is very hard to break the cycle once you get going in it. If you are someone who is serious about getting out of debt, it’s important to have an emergency fund in place, because you will have a hard time doing so if financial times get tough. As far as how much to save–it really depends on your financial situation. If you have a lot of debt to pay off, or if you are living paycheck to paycheck, you might only want to save $500 – $1000 at first. That way you will have something to fall back on if something major happens. If you are in decent financial shape, but don’t have much savings, you might want to consider trying to save 3-6 months worth of living expenses in your emergency fund. That way if you suddenly lost a job, you would have enough money to live on for 3-6 months while trying to find another job without any panic. As with any financial situation, you know how much you can reasonably put back into savings. In this situation, some is definitely better than none. So where do you put your money? A WCU savings account would be the perfect place to keep your emergency fund. It’s easy to access online with our home banking and mobile app. It’s also easy to access while traveling (in case something happens) with our Shared Branching Network all over the country. A savings account is just accessible enough that you can get to it in a hurry if need be, but not as easy as keeping the money in your checking account or in an envelope in your bottom drawer. You don’t want it to be too convenient to where it is tempting to dip into it in non-emergency situations. So that’s the case for an emergency fund. It’s something everyone should consider having in their lives, no matter what their financial situation. When you plan for emergencies, you will navigate through life’s troubles with much less panic–especially over your finances.